Liane de Pougy (2 July 1869 – 26 December 1950), was a Folies Bergère vedette and dancer renowned as one of Paris's most beautiful and notorious courtesans. The marriage was not a happy one. Anne-Marie later wrote in her memoirs that her new husband took her violently on their wedding night, an event which left her emotionally scarred. It is said that the groom was a brute and abused her – she wore the scar of his beatings on her breast for the rest of her life. When Armand Pourpe's naval career led him to a billet in Marseille, Anne-Marie took a lover, Charles-Marie de Mac-Mahon (1856-1894), 5th marquis of Éguilly. When her husband found them in bed together he shot her with a revolver, wounding her on the wrist. Deciding to leave her husband, Anne Marie sold her rosewood piano to a young man who paid 400 francs cash for the instrument. Within an hour, Anne Marie was on her way to Paris, leaving her infant son with his father, who in turn sent his son to live with the boy's grandparents, in Suez. With the failure of her marriage, Anne Marie began dabbling in acting and prostitution and it is now known that she was a heavy user of both cocaine and opium. She began her career as a courtesan with the Countess Valtesse de la Bigne, who taught Anne-Marie the profession and whose monumental bed was made of varnished bronze. Describing herself as vain but not a fool, Anne-Marie cultivated an interest in paintings, books and poetry, but avoided intellectual depth, which she considered dull. She preferred café-concerts and popular songs to William Shakespeare or Richard Wagner, and made minor appearances in the chorus of Folies-Bergere in Paris in St. Petersburg and cabaret clubs in Rome and the French Riviera. She was a conscientious bookkeeper. After moving to Paris, from her position at the Folies she became a noted demimondaine, and a rival of "La Belle Otero". She took her last name from one of her paramours, a Comte or Vicomte de Pougy, whilst other lovers included Mathilde de Morny and Émilienne d'Alençon. 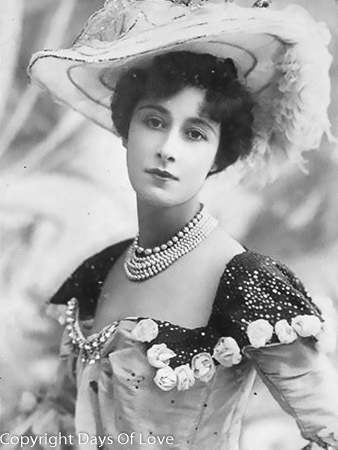 Actress Sarah Bernhardt, faced with the task of teaching Liane to act, advised her that when she was on stage, it would be best to keep her "pretty mouth shut". Liane became so well-known as a performer at the Folies Bergère that the 1890s English female impersonator Herbert Charles Pollitt referenced her in his drag name Diane de Rougy. de Pougy's lesbian affair with writer Natalie Clifford Barney is recorded in her novel Idylle Saphique, published around 1901, and now published in Spain in translation by the poet Luis Antonio de Villena. In 1899, after seeing de Pougy at a dance hall in Paris, Barney presented herself at de Pougy's residence in a page costume and announced that she was a "page of love" sent by Sappho. Although de Pougy was one of the most famous women in France at the time, constantly sought after by wealthy and titled men, Barney's audacity charmed and seduced her. The two were said to have had deep feelings for each other for the remainder of their lives. Upon her marriage to Prince Georges Ghika on June 8, 1910 she became Princess Ghika; this marriage ended in separation, though not divorce. Her son's death as an aviator in World War I turned her towards religion and she became a tertiary of the Order of Saint Dominic as Sister Anne-Mary. She became involved in the Asylum of Saint Agnes, devoted to the care of children with birth defects. She died at Lausanne, Switzerland.